Location: Goblin Valley is located in the center of the northern part of Southern Utah, about 35 miles south of Interstate 70. The closest civilized area of any size is Hanksville, Utah located 30 miles to the south. I'm not sure if Hanksville can be considered civilization though. The population is barely above 200 people. The other "close" city is Green River which is 50 miles to the east. Cost: Day Use Fee is $8. Camping fee is $18 with an additional reservation fee of $8. Operating Seasons and Hours: The park is open all year long from 6:00 am to 10:00 pm. This was the fourth and final stop of the fourth day of the road trip that my husband and I took around Southern Utah back in 2010. We left Capitol Reef National Park and drove about and hour and a half to Goblin Valley State Park. 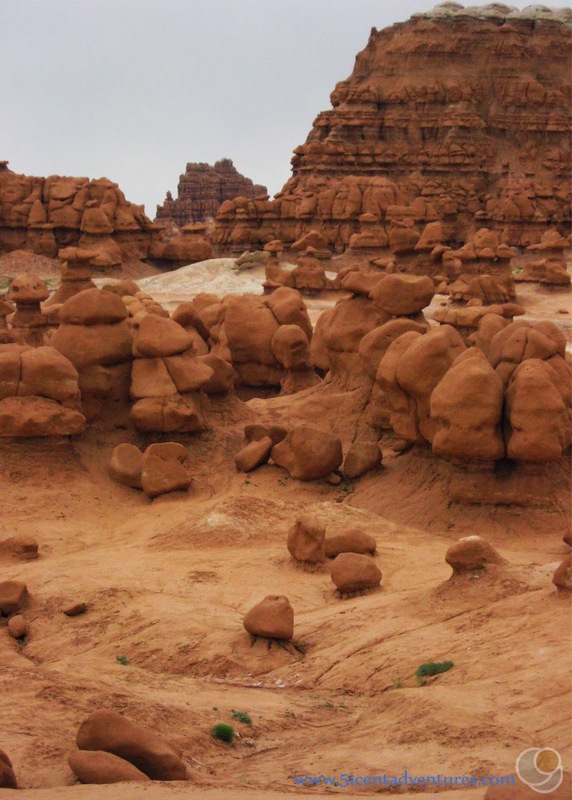 The scenery along Highway 24 on the way to Goblin Valley was bizarre and worth mentioning. The rocks in Capitol Reef National Park had been the typical red that is iconic for Southern Utah. However, the landscape drastically changed as soon as we left the park. The hills and mountains became drab shades of grey and brown. Some of the mountains looked like they were in an unfinished model. It was as if they were made of layers of cardboard, and were waiting for some artist to add details. We joked that the people in charge of creating the scenery had run out of money before they had the rocks painted. The road turned to the west and then to the south again. Soon we were approaching Goblin Valley State Park. Given the park's remote location, and the fact that it was a Monday night in the middle of May, I assumed that the park would be deserted. Instead I was surprised to see a sign that said the park's campground was full. Apparently we weren't the only people interested in sleeping in the middle of nowhere that night. I was glad I had reserved a campsite a few months earlier. I expected the campground to be very primitive. I was pleasantly surprised to find that it had many amenities. Each site had a little structure build around the picnic table to provide shade. The bathrooms had hot running water, flushing toilets, and electric outlets. The bathrooms even had showers. 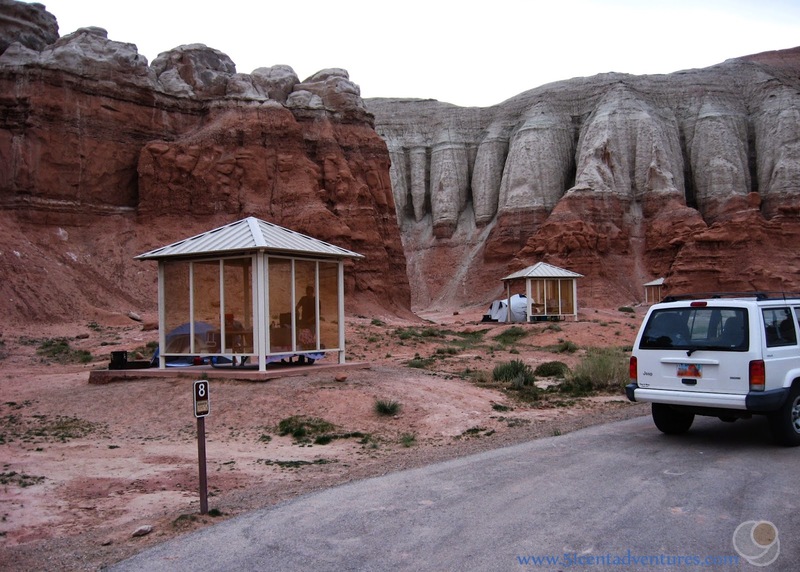 The bathrooms were luxurious when compared to the bathrooms at the campgrounds in Zion and Bryce Canyon National Parks. The drinking water was a little yellow colored, but other than that I was very impressed by all the accommodations at this campground. Which is good because it also happened to be the most expensive tent campground that we stayed at during this road trip. It was late, and the long day of driving was catching up to us. Exploring the park would have to wait. We set up our tent, made dinner, and went to bed. I was hoping for a good night's sleep. I'd spent the past two nights shivering in the cold air at 8000 feet above sea level in Bryce Canyon. The elevation of this campground was much lower and the air was warmer. My husband and I anticipating sleeping with only a light sheet over us - if we needed anything at all. Well, we did need covers, but not to protect us from the cold. A fierce wind started blowing. Somehow the gale was strong enough to force sand and grit under our tent's rain-fly, and then down through the mesh roof of our tent. We were sand blasted all night long. My husband and I pulled the sheet over our bodies and tried to sleep as our tent shook violently. We laughed that this was a memorable, way to spend the night of our third wedding anniversary. In the morning we hurried to pack everything into our Jeep. 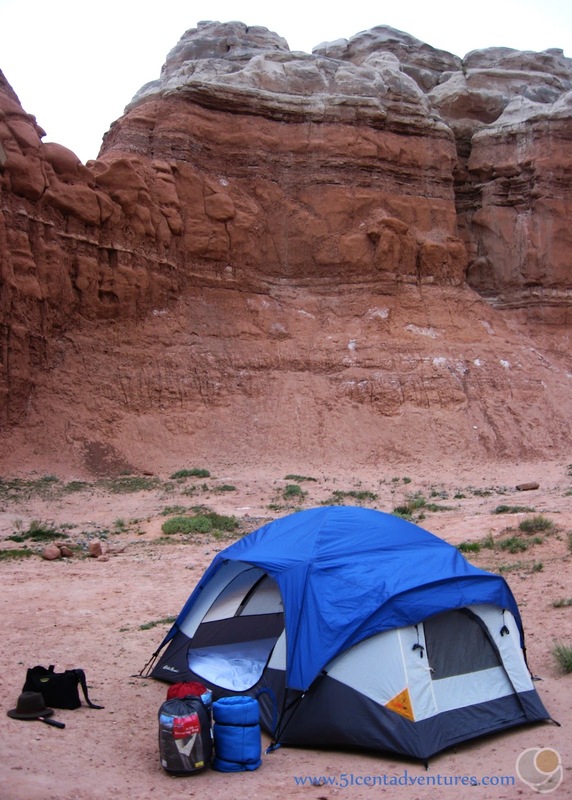 We bid goodbye to our dusty campsite and drove to the parking lot of the actual Goblin Valley inside the state park. This was where we could finally see the odd shaped rocks that make this state park unique. A dust storm picked up as soon as we made it to the observation point. My husband shot a few seconds of video of the storm before we retreated to our car. The storm didn't last long. 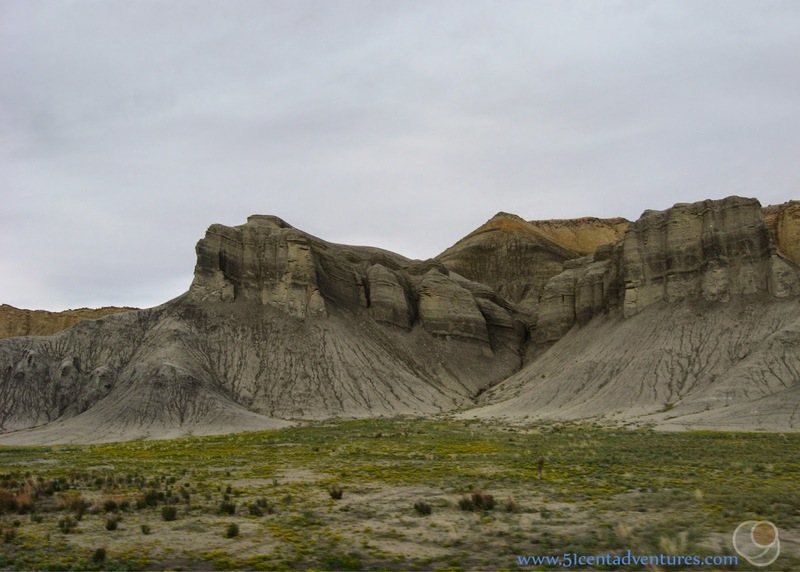 Soon we were able to get out and walk among the geologic features known as hoodoos or goblins. Of all the places we'd visited so far on this trip, Goblin Valley was probably the strangest looking. The scenery in Goblin Valley is so unique that it was used as the location of an alien planet in the movie Galaxy Quest. Walking around that valley was the closest I'll ever come to visiting an alien planet. Odd shaped rocks were everywhere. My husband and I decided that the rocks didn't look like goblins to us. Instead they looked like noses. We could have gone hiking on one of the park's several trails. However, I wasn't feeling up for a lot of hiking that day. I was 11 weeks pregnant with twins. After all the hiking I'd done in the past 4 days my body was telling me that I needed to take things easy. So instead we just walked around the valley for a little while and enjoyed viewing the Goblins up close. 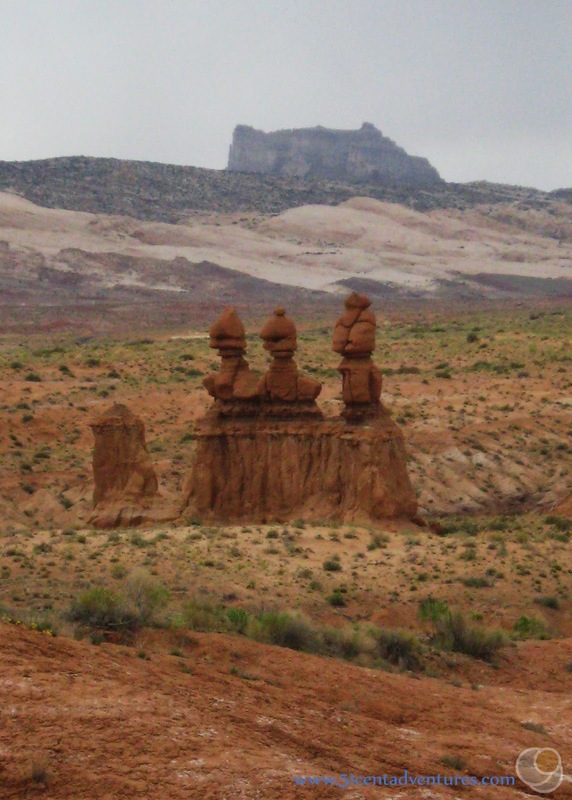 As we left the park I took a picture of some of the most iconic hoodoos. This feature is off by itself north of the valley where all the other hoodoos are located. Of all the features in the park, this is the one that looks the most Goblin-like. 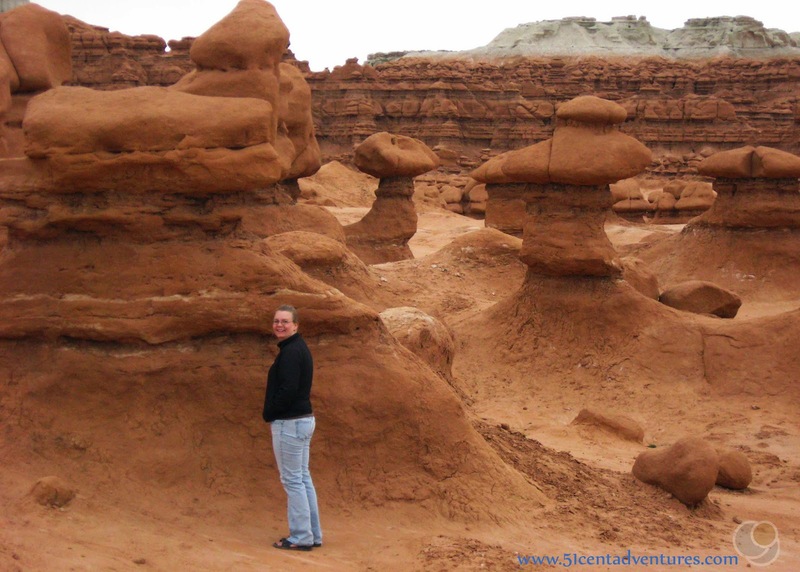 When I think back on our Southern Utah Road Trip, Goblin Valley State Park is one of my favorite places. It kept surprising me at every turn. I look forward to planning another trip to visit this place again. Recommendation: Everyone should visit Goblin Valley at least once. You will never forget what it is like to get an up close view of the goblin shaped rocks. 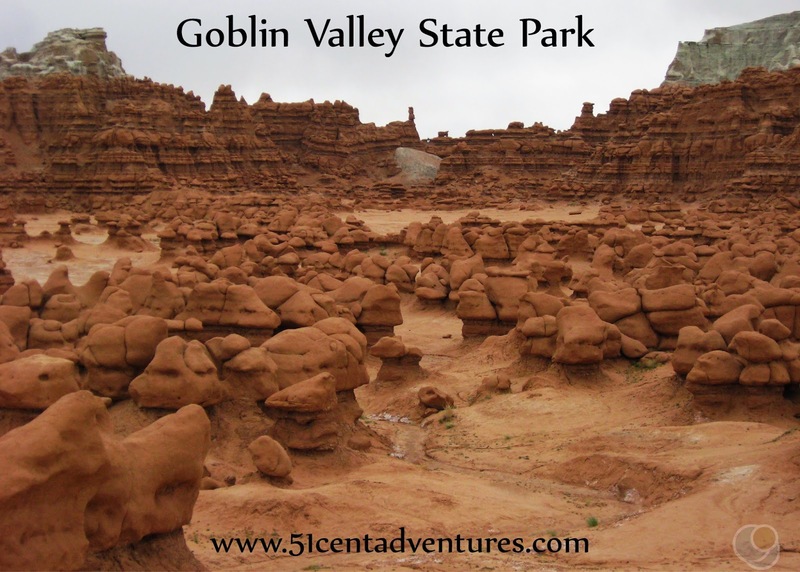 Directions: Despite it's remote location, Goblin Valley is easy to find. 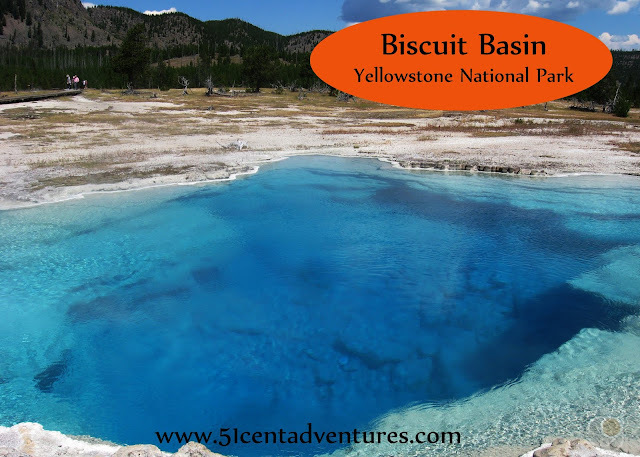 The best way to reach the park is by travelling on I-70 until you reach Exit 149. Then travel south along Highway 24. After almost 24 miles you'll turn right onto Temple Mt Road. After 5 miles turn left onto Goblin Valley Road. That will take you right to the entrance of the park. There are plenty of signs to guide you along the way. Additional Information: In October of 2013 Goblin Valley made headlines when a man pushed over a goblin while two of his friends watched. One of the men filmed the destruction, and posted the video online. You can read about the story here. http://www.huffingtonpost.com/2013/10/18/goblin-valley-boy-scout-leaders-destroy-rock_n_4122488.html If you visit Goblin Valley on a Saturday evening you can participate in a ranger-led hike to "The Fallen Goblin." The hike is about 3/4 of a mile long. The park's naturalist will talk about the unique geology of the area, and why visitors should respect the features. 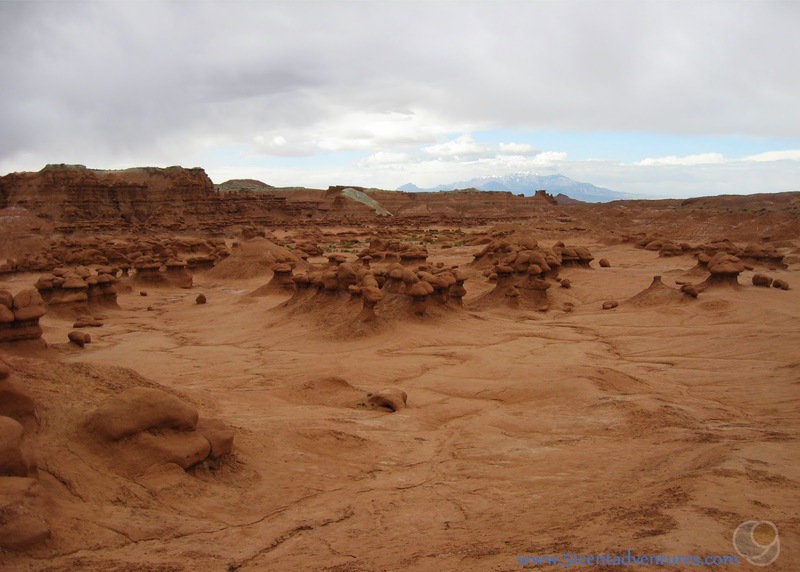 Places Nearby: The San Rafael Swell is located to the north of Goblin Valley. This remote area is full of interesting places. In 2012 my husband and I passed through the area again and discovered Black Dragon Canyon inside the swell. The turn off for Black Dragon Canyon is only 2 miles away from where Highway 24 meets I-70. It would be very easy to add Black Dragon Canyon to your list of things to do while visiting Goblin Valley. 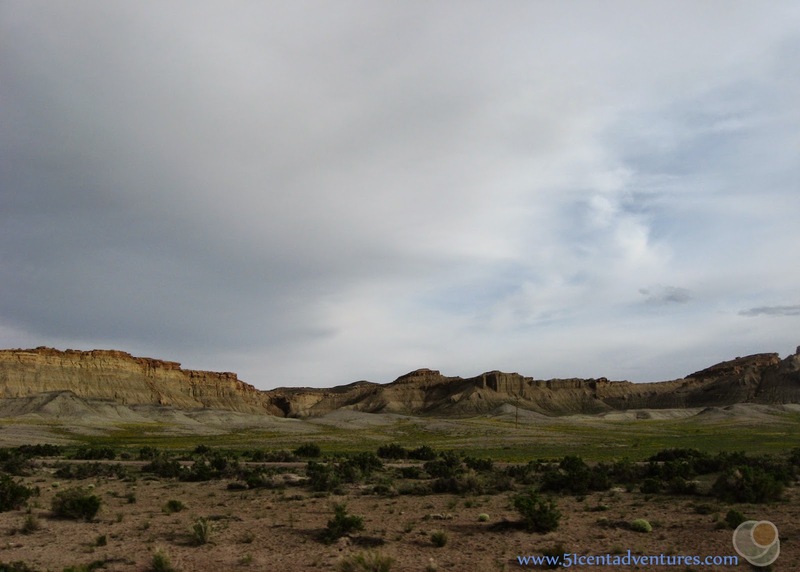 Check out http://www.sanrafaelcountry.com/ for some ideas of other things you can see and do around the San Rafael Swell.